FANART: AVATAR I LOVE YOU!!! So weekend before finals here in Athens. For me that will be 2 exams and 3 critiques. Believe it or not I am actually on track with time set aside to actually study (rather than do art) Feeling much less stressed than I was earlier this week. Apparently I am a super hard worker and pretty damn focused when I need to be. I get the feeling my typing may be waking Britt up so I’ll call it a night. This was written by Hannah. Posted on Sunday, December 9, 2007, at 1:09 AM. Filed under Life. Bookmark the permalink. Follow comments here with the RSS feed. Post a comment or leave a trackback. 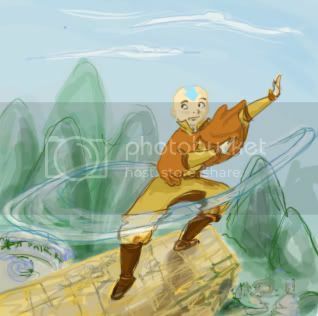 And it’s beautiful, btw~ Love the air bending! YAY this made me pretty happy when I drew it! wai!! Is that your hand?? hum…i guess it’s still cool. ne, are you gonna be in town over the break? :D? ‹ That’s Right How WOULD you?